BIGPIE. We are a full service Interactive & Design Agency located in Venice California. BIGPIE services include all aspects of graphic design, branding, id, print, infographics, presentations, web development, web design, animation, motion graphics, micro-sites, online advertising, online marketing, mobile development, mobile applications, social & content creation, superior server hosting and IT support. If you have a new design idea, logo, website, animation, print project or anything else in mind, let us help you achieve your creative goals. BIGPIE llc, www.bigpie.tv, bigpie, Venice, Ca, 90291, 310.752.7707, info@bigpie.tv. Yonder approached us with a design & code facelift to their current squarespace built website. We overcame the many squarespace obstacles that were thrown at us. 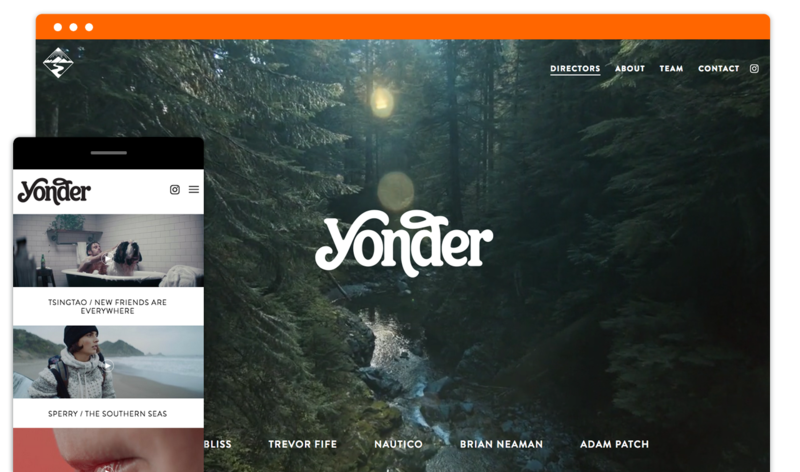 The end product is what exactly Yonder was looking for, an ultra minimal, full-screened desktop and mobile experience. We had lots of fun with this project. Yonder is a bespoke content studio with offices in Portland and New York. Their accomplished directors create premium content for a handpicked selection of agencies and clients who share their ethos. Their mission is simple: to boldly thrive on the outskirts of a crowded industry in that special place where quality outshines quantity, and to have fun along the way.